“The Price is Right!” Or is it…? What if you were a contestant on the Price is Right and Bob Barker or Drew Carey (…although it’s just not the same without Bob, is it?) asked you the price for a bottle of water? The savvy shopper would ask a few clarifying questions: “Where you are buying the water?…at a grocery store?…from a hotel mini-bar?… Is it the super fancy water with electo-whatevers that will make me look like Jennifer Aniston? Got you thinking, didn’t we? The price of a bottle of water can vary A LOT. We launched a Pricing Strategy Learning Institute this summer for First 5 LA’s Social Enterprise Grants Program, coordinated by Families in Schools with this water-pricing dilemma. This initiative led 7 social enterprise grantees through a series of Learning Institutes on everything from developing a “fast pitch” to cultural challenges of running a social enterprise, including individual coaching sessions and invaluable peer learning. I have to tell you, it was really refreshing to work with these amazing, innovative organizations using the power of business to bring about social change. Nonprofits often sell themselves short on the value they provide to end users and their supporters. So, we encourage nonprofit social enterprisers to aspire toward profitability — yes, push yourselves to be as effective and efficient as any for profit competitor would. Yet, be realistic about financial prospects given the business you are in. As a nonprofit social enterprise, in addition to the business costs to run your enterprise, you carry social costs to deliver on your social impact. Relatedly, understand that not all social enterprises have to make a profit to be successful. Say what? Your definition of success, which is different for every organization, depends on the balance between social and financial returns you seek. With that said, if your social enterprise doesn’t make a profit, it must be subsidized in another way (e.g. government grants or profits from a more lucrative social enterprise) to be financially viable. Pricing is just one lever of your Marketing Strategy. Your pricing (and other 3 Ps: promotion, placement, and product), marketing, and business strategy should all align with your overall organizational mission. 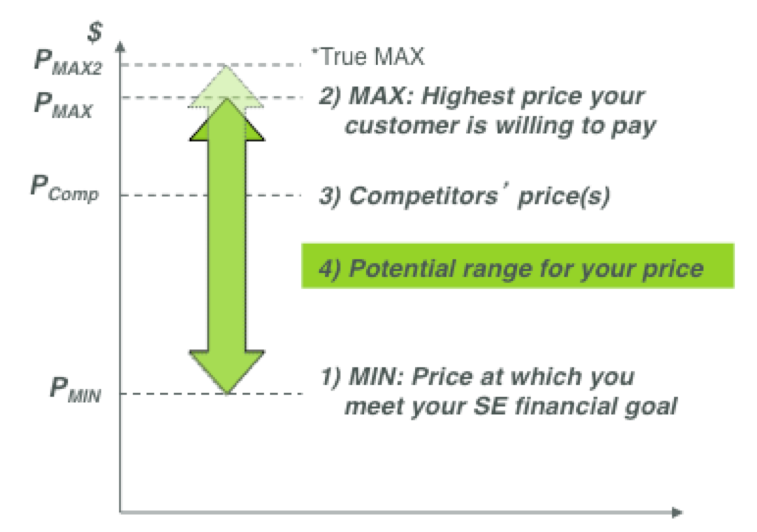 The potential range for your product’s price is between the maximum price your customer is willing to pay and the minimum price you can charge and still meet your organization’s financial goals. You should also consider the price your competitors are charging and how your product’s different and, hopefully, better than your competition. If you don’t have the time right now to calculate your organization’s potential pricing range, there are some common pricing strategies (like “Freemium,” high-low, psychological, product line and bundle pricing) that can help you. Learn more about these pricing strategies and a lot more here. You just have to promise that you’ll make time in the future to calculate your potential pricing range. Deal? “Small variations in price can raise or lower profitability by as much as 20 percent or 50 percent”. Trust me, people – it is well worth the effort to think strategically about the price you are charging! Hope you found that helpful. Want us to share more take-aways? Is there another topic you’d like us to write about? Let us know by leaving a comment! Know a social enterprise that needs some pricing guidance? Share this post by clicking on the Facebook or Twitter icons below. Your customer’s true maximum price is based on value to customer of which they are not aware. Think of something you didn’t know you wanted because you didn’t know it existed yet. Hinterhuber, Andreas and Stephan Liozu. “Do you even have a pricing strategy?” www.inc.com, Inc. 28Feb 2013. Accessed 28May 2013.